An aircraft worth its weight in gold? Airbus announced last January that it had raised the list prices of its commercial aircraft by an average of 5.8%. It had not updated its prices since 2008. You may see the current prices here: Airbus list prices. Boeing also discloses in its website the range of list prices of its aircraft. Those prices haven’t been increased in the last two years. Few years ago, I saw for the first time a comparison of prices of aircraft per kilogram. It was prepared by a teacher I had at EOI Business School in Seville, Felipe Moran, who later has become a co-worker. 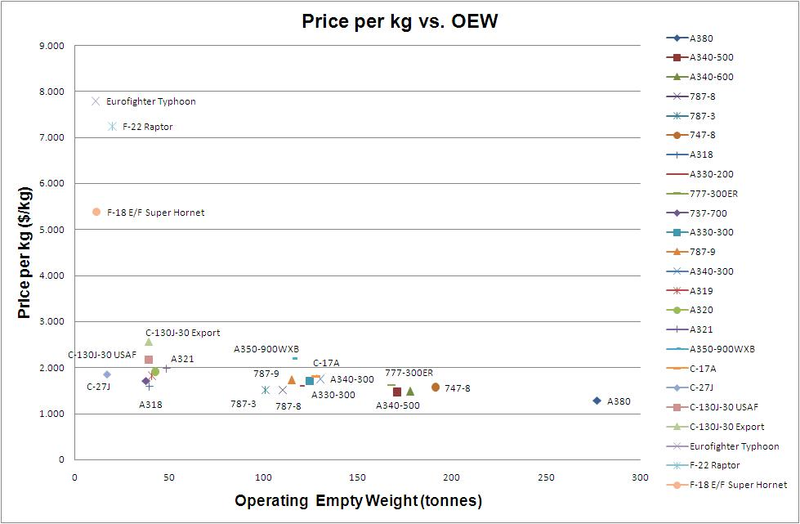 With this post I will start a series of comparisons, the first one being precisely that one: an update on price per kilogram of aircraft. We already saw where to get the prices from. The other input we are going to use is the weight of the aircraft, what is called: Operating Empty Weight (OEW). You may find this information in various places, I recommend you to pay a visit to Boeing’s “Airplane Characteristics for Airport Planning”, where you will find very detailed data of all its commercial aircraft. (While gathering this info I also came across the following section dedicated to fun facts of the legendary Jumbo 747). Combining these inputs we can build the following table. Price per kg of commercial aircraft. 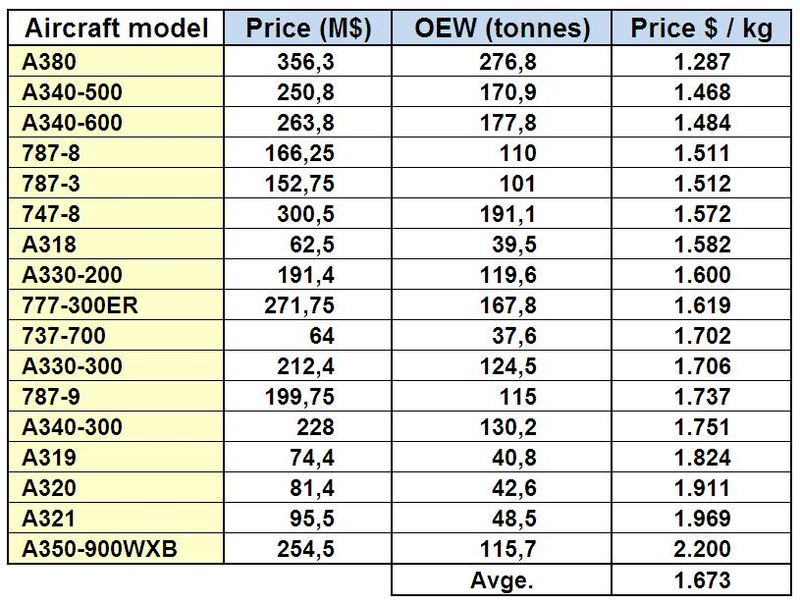 There doesn’t seem to be a clear discrimination between older and newer aircraft (A380 and some 787 models rank among cheapest, while A350-900 and 787-9 are among the most expensive). Smaller Airbuses rank among the most expensive aircraft in a per kg basis despite the suggested price war that was reported by the specialized press in the recent years. With the exceptions of A350-900 and 787-9 there seems to be a very slight trend in bigger aircraft being cheaper in this per kg basis. One may argue that once the frame of a certain size is built, building a bigger one might not cost that much. Now, let’s talk about the Military Transport business. Do we think those aircraft are more or less expensive? On one hand, those aircraft are not carrying systems such as the in-flight entertainment and, on the other, the scale of the market is smaller (with few exceptions such as the C-130) and they do carry diverse military systems, protections, etc. What is the trend weighting more in the balance? Military transport aircraft price per kg. As you can see, military transport aircraft are on average 25% more expensive on a per kg basis. There is much more technology in them than people tends to think… they are clearly not just flying trucks. As you may have noted I have not included any sources for the prices of these aircraft, since they are rarely disclosed. I have used prices reported by the press and US budgets. Let’s stretch the argument a bit more… What is the trend for fighter aircraft? This time scales are bigger than in military transport. Does this make them cheaper? See the table. Fighter aircraft price per kg. Not even close. Fighters are around 3.2 and 4 times more expensive than military transport and commercial aircraft, respectively, on a per kg basis. We can see in the following graphic all these aircraft together and maybe spot those trends. Now that we have an idea of how much aircraft cost per kg (1,700$ commercial aircraft, 2,100$ military transport aircraft and 6,700$ fighter aircraft)… is this expensive? Expensive compare to what? Let’s relate these prices to something closer to us. The best-selling car in Spain in 2009, was the Renault Megane (with 52,156 cars sold). It costs about 17,700 € (or 24 k$) and weighs 1,150 kg, this yields: 21 $/kg, clearly cheaper, about 80 times cheaper than commercial aircraft on a per kg basis. More up-scale cars such as the Mercedes Class E 350 CDI (56,000€ and 1,825 kg) or the Audi Q7 4.2 TDI (85,000€ and 2,605 kg) are more expensive per kg, 41$/kg and 44 $/kg, respectively. This is 40 times cheaper than commercial aircraft. It may be worthy to note that in the cars we see the completely opposite trend than that we saw in airplanes: the bigger the car the more expensive on a per kg basis. Let’s compare this yet again with some other unrelated luxury item: Jamón Ibérico Puro de Bellota de Jabugo 5J. Today it was on offer in El Corte Ingles website for only 449€, a piece of about 7 kg, yielding: 87 $/kg. This is twice more expensive than buying a Mercedes (this may be the reason why it was an offer from Sanchez Romero supermarkets) but still 20 times cheaper than a commercial airliner. The kilogram of gold is in the order of 35,400$, clearly more expensive than any aircraft. After all, nowadays, we may find no aircraft worth its weight in gold.